I’ve carried an iPhone around for some time (probably since a year after they were first released). Overall, it’s been a good choice for me and most of the initial annoyances I dealt with have been resolved over the course of several generations. However, one problem I’ve dealt with is sometimes not realizing when I’ve received a text message or have an incoming phone call (I usually carry my phone in my pocket). This wasn’t a constant problem but it did happen often enough to be an issue. A couple of years ago I started searching for a wristwatch with Bluetooth capability that would vibrate or provide some other form of notification that was obvious. I did find devices that were almost what I was looking for but they were too expensive (several hundred dollars), had poor reviews, or they looked more like bracelets than watches. I had no interest in wearing two devices (for example, a watch and a device just for notifications) so I didn’t bother acquiring any of the devices available at the time. 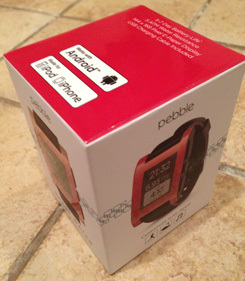 Then I become familiar with the Kickstarter project for the Pebble Smartwatch. Sometimes I’d read about the progress of the project on tech sites or hear it mentioned in the TWiT podcast. I was interested, but not interested enough to become an early adopter so I waited. I also wanted to see the watch in person before deciding to find out just how big the watches really are. This year the Pebble went into full production and was eventually available for sell at Best Buy stores. On a recent visit to a store I remembered to look for one. Sure enough, a couple were in stock. After seeing it in person I decided it wasn’t too large to wear (I didn’t want to walk around with a clunky box attached to my wrist) and finally purchased one. In Best Buy stores they sell for about $150. They are also listed on Amazon but are usually much more expensive. If the watch was any larger I’d probably have been less inclined to purchase it but, as it is, it’s not bad. I have no doubt the next generation will be smaller but it’s alright and I don’t feel like I have a wildlife tracking monitor stuck to my wrist. Most men probably won’t have a problem with the size but most women may be more likely to find it too bulky. My Pebble had to be charged before I could use it. According to information online they typically require about 2-3 hours to reach a full charge from a depleted state. I only charged it for about 45 minutes and was easily able to use it the rest of the evening without a recharge. The charging cable is proprietary. It uses a couple of magnets to attach to the side of the smartwatch though, unlike Apple MacBook charging cables, it doesn’t grab very well. Once the connection is seated properly it will need to be set somewhere that it won’t be disturbed. Even a tiny bump can easily knock the charger off the watch. Since this is a proprietary cable I went ahead and ordered a spare (less than $10 from Amazon) so I could leave one at home and keep another in my work bag. The setup didn’t go as smoothly as I had hoped. Though I had the Pebble Smartwatch app installed on my iPhone I wasn’t able to get the app to install the latest firmware update to the Pebble. It attempted to update the Pebble but it failed and would get stuck in Recovery mode. Note that I have an iPhone 5 running iOS 7. I was able to resolve this problem by installing v. 1.12.1 firmware from a link in a Pebble support article. That update worked properly. Once it completed I was then able to install the latest firmware update directly from the app. With the latest firmware I found that everything worked great. From that point on, after having everything paired and the app running, the Pebble showed notifications, text alerts, and incoming calls. I’ve already had a few experiences where I received a text alert or phone call that I might have not noticed immediately if I hadn’t been wearing the Pebble. The vibration is obvious and the screen lights up so it does a good job of alerting me to notifications. With the recent firmware update I can receive almost any type of notification that the iPhone provides and, via notification settings in iOS 7, I can determine which notifications are sent to the watch. A simple example is e-mail notifications. I do not have it set to notify me of every e-mail that I receive. Instead it only sends alerts for “VIP” e-mails. My phone can receive Growl notifications (via Prowl) from my home automation software. Those are configured to display on my Pebble so when someone enters our house for the first time each weekday I am instantly aware that this has occurred. I’ve charged the Pebble for a bit here and there so I haven’t used it until the battery discharged completely. One of my friends also purchased one – he was able to use it for five days before it required a recharge. According to the manufacturer’s information the Pebble typically runs about five to seven days before requiring a recharge. So far I’ve recharged mine about once every two or three days just to make sure it doesn’t die at an inconvenient moment. The battery status can be found on the main menu (upper right corner of the screen) though it isn’t always present. It will appear when recharging. According to online documentation the battery level is only visible when it falls below certain thresholds. As far as I know it doesn’t provide any other status alerts for a low battery though I have no doubt this feature will be added in later firmware updates. Pebble states that the added battery drain on the phone itself should be around 5%-10% per day and that seems to be consistent with my experience. One of the great features of the Pebble is that its watchface is customizable. The device provides a handful of different watchface styles that can be changed with the tap of a single button. If those aren’t sufficient there are a few sites dedicated to providing watchfaces and apps. It’s also possible to build your own watchface using the Watchface Generator website, which I’ve also used. I haven’t really dived into using apps on the Pebble. I did purchase and install Smartwatch+ from the App Store but it wasn’t displaying some pieces of information on the phone. My suspicion is that the app may have some issues with iOS 7. This isn’t really a major issue for me, the basic features of the watch are all that I’m interested in anyway. The Pebble has a backlight that can be activated by flicking one’s wrist or pressing a button. I chose to disable the motion activation as it had a tendency to activate when I didn’t need it to. Now I only use a button if I need the backlight. The wristband is a fairly standard rubber 22mm wristband, which can be replaced. I don’t have immediate plans to replace the wristband but it can be swapped out if desired. Overall I’m pleased with the device. It’s worked well, is relatively inexpensive compared to similar devices, has the features I wanted, and after the initial setup I’ve had almost no problems. Twice it has disconnected from the phone’s Bluetooth, which seemed to require that I reboot the phone to correct the problem, but if this remains a rare occurrence it should be one that I can live with. Updated 11/24/2013: It’s still working great but since I got the watch it has disconnected from the iPhone once a week. There appears to be a pattern – each of the three times that I discovered it had disconnected was on a Sunday morning. This still isn’t frequent enough to be anything more than a minor annoyance. Updated 12/10/2013: It seems I was mistaken and that it was just a coincidence that the disconnects occurred on Sundays. I have experienced disconnects on other days. These disconnects are still relatively infrequent. I’ve since learned that the Pebble cannot be charged using the 1 A port of my Anker 10,000mAh battery (I suspect it doesn’t draw enough charge to keep the Anker battery in a charging mode) but it will charge from my Monoprice 5,000mAh battery. The instant I received a notification for the latest Pebble update I started having problems with notifications getting to the Pebble. Despite restarting both the phone and the watch several times, disabling and re-enabling Bluetooth, and various other measures, only one change seems to have re-enabled notifications again, at least in a way that the Pebble app will now show that notifications are enabled. Go to Settings -> Bluetooth and then click the circled letter i next to the entry for the Pebble-LE connection (this will include part of a unique identifier for your Pebble). Next, tap Forget this Device. If your problem is the same as mine then you should be able to go to the Pebble app and tap the Enable Notifications button. 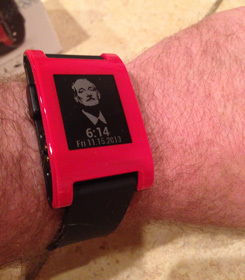 This time it should ask to pair with ‘Pebble-LE’ and then move on to a success screen. Updated 02/22/2014: A couple of updates later and I’ve found that I’ve had very few problems with the watch. I think I only had to fully reboot the phone once in the past month to re-establish a connection. I’ve also replaced the watchband with a leather band that I purchased from Amazon. The software has improved significantly though I think that being forced to create an account with the 2.0 update is unnecessary.